The Independence Tray Table is a welcome addition to any household. 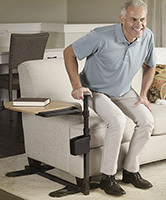 This handy table can be used by anyone who needs a little help in getting out of a chair while re-cooperating or someone who just wants to get a bite to eat while watching their favorite show on TV. Unlike other TV Trays, the Independence Tray Table swivels around 360 degrees, so you can slide it out of the way without any risk of spilling your drink. This stylish TV tray table has several handy features which include and organizer compartment to hold your glasses or TV remote control, a support handle to make sitting and standing easy, a utensil tray to keep commonly used items with easy reach and a cup holder to hold that refreshing beverage close at hand. The various dimensions of this unique TV Tray table is pictured below. This table weighs 20 pounds but it's handle can support 250 pounds and the tray itself can hold 30 pounds. The Tray is made of 100% bamboo and can slide 360 degrees our the way. 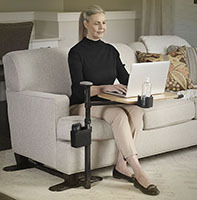 The Independence Tray Table is adjustable in length and width to fit any couch, chair or lift chair. The Independence Tray Table is listed with zero cost since it is not able to be ordered online. The Signature Life product line is only available for sale from our company in our store. Please do not order it from our website.